I have always been attracted to prints. More modern printing technologies, especially digital methods, released many of the restraints of earlier printing techniques, allowing for greater freedom in types of mark making. However, the limitations of early etchings and engravings can bring to the fore mastery of line economy and command of spatial composition in a way that less restricted media does not necessarily expose. When color is introduced, the forced palette constraints can also reveal exceptionally smart use of color and unique combinations. The Industrial Revolution’s transformation of the printing process and increase in the spending power of the middle class led to decorated surfaces being proliferated in a way they had never been before. Media produced in the Victorian Era, which directly followed the Industrial Revolution, therefore offers countless exemplary print works. It is often recognized for its highly ornamental look featuring a graphic quality (directly influenced by the innovations in printing capabilities) that is easy to trace in our printed materials today. Design excellence is everywhere to be found in the remnants of middle class life in this period, from match boxes to book covers, to…board games. I personally love these types of “low art” examples. Although not highly valued in their time, they grant us access to the daily life of a period more than most forms of “high” or “fine” arts. Additionally, they usually display a very specific version of the techniques available at the time — necessity is the mother of invention, as they say. In this case, more commercial prints simplified images and relied heavily on the black outline in order to limit the number of colors, which allowed for a cheaper, faster process. These aspects were seen as markers of lower quality in their day, but now earn the prints a place in the history of image making for being exemplary of a certain time, place, and look. In the largely agricultural economy of Puritan New England, board games, like most leisure activities, were not only looked down upon but seen as a punishable offense. Objects of chance, such as dice, were viewed as instruments of the devil. 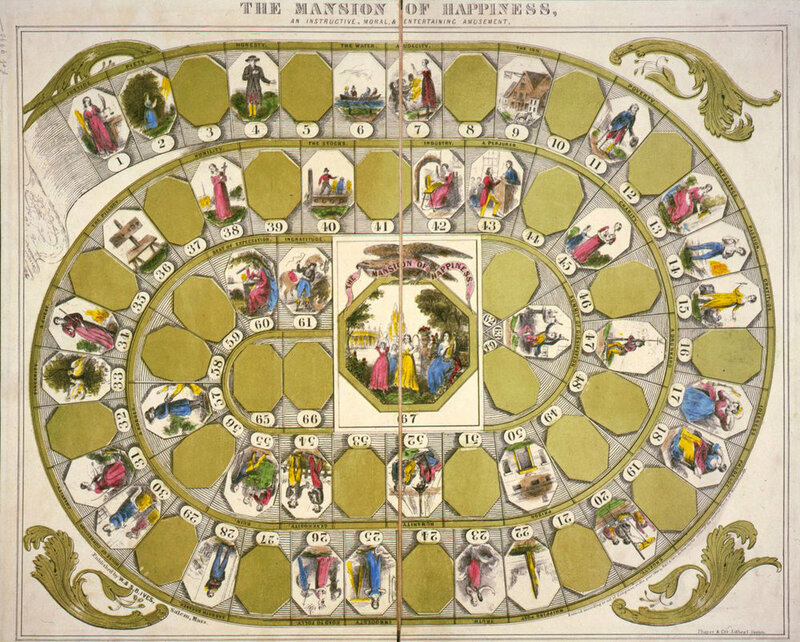 “The Mansion of Happiness, An Instructive, Moral, & Entertaining Amusement” outlined the path to heaven. As the culture continued to trade certain Puritanical ethics for the rewards of materialism and capitalism, the heroes of the American imagination changed accordingly. This transformation was reflected in the games that families used to “instruct and amuse” their children. A game that we still play today was the first to move away from religious virtues and focus on what was increasingly seen as a successful daily life. 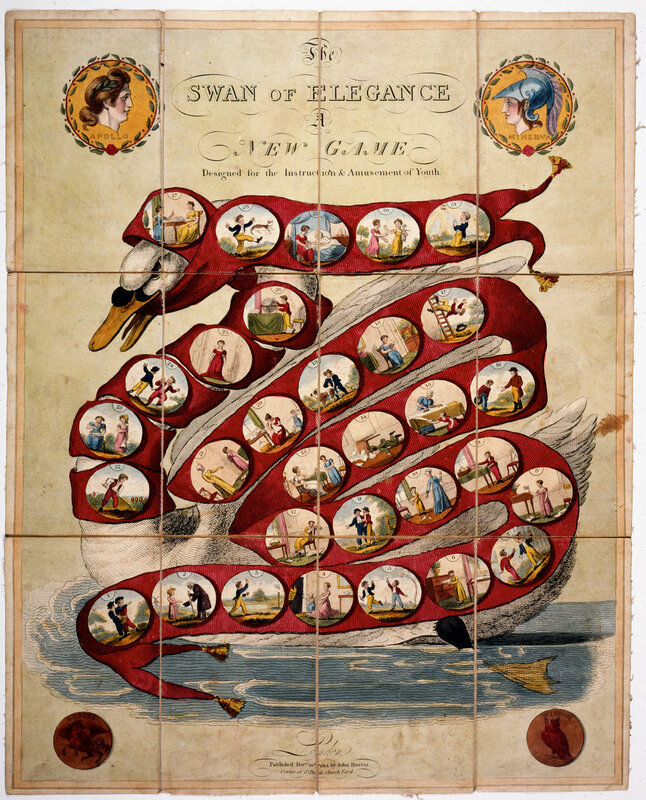 The Checkered Game of Life, released in 1860, sold 40,000 copies its first year. The 1880s saw the production of many “rags to riches” games that allowed children to climb the corporate ladder. This trend reached a head with the familiar classic, Monopoly, in 1935. "Science in Sport or the Pleasures of Astronomy," 1804.